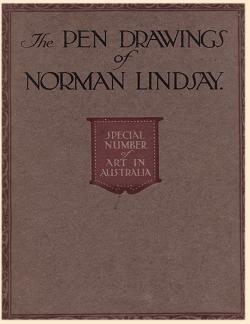 Prolific illustrator, painter, sculptor, author and scale modeller, Lindsay is widely regarded as one of Australia's greatest artists. Many of his more controversial works featured sumptuous, provocative nudes. During a 1939 exhibition tour of the United States the train in which the paintings were travelling caught fire. When the smouldering train pulled in to the next station, the remaining paintings were burned by a mob of wowsers incensed by the licentious images. A large body of his work is housed at The Norman Lindsay Gallery in Springwood, NSW.